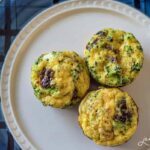 This mini quiches are an easy and healthy breakfast option that even the fussiest of kids will love. This post is sponsored by Shaw’s. All opinions and text are my own. One thing I’m forever trying to do is to figure out quick, easy and nutritious breakfast ideas for my family. I’m also always trying to sneak veggies into foods in unexpected ways, hoping that my fussy three year old won’t notice them! One of my latest creations is these sun dried tomato, broccoli and bacon mini quiches. I’m saying they are a breakfast food simply because they are egg-based, but in fact, my 1 year old loves them for dinner. They are definitely a hit in this household with kids and adults alike – and they are not only delicious but nutritious too. sold in my area exclusively at Shaw’s supermarkets. If you do not live near a Shaw’s, you can find Open Nature products exclusively at all of the Albertsons Companies family of stores including Albertsons, Safeway, ACME Markets, Jewel-Osco, Vons, Pavilions, Randalls, Tom Thumb, Star Market and Carrs/Safeway. Since Open Nature is dedicated to helping people live a clean lifestyle, I can feel good about my choices. A trip to the supermarket can be quite exhausting for me – it takes so much longer when I have to read through the ingredient list on every single product so that I can ensure I’m feeding my family good food. But the Open Nature products make it easy – their food items are non-GMO and are minimally processed, all at an amazing value. I don’t have to worry about artificial or bad ingredients since I already know their products don’t contain them. Crisp bacon and sundried tomatoes add a lot of flavor to the quiches. Don’t add any fat to the pan before cooking the bacon and it’s usually a good idea to allow the bacon to soak into some paper towel once it’s cooked to get rid of any excess fat. I keep the custard for these quiches lighter than is traditional – no heavy cream and instead I use a quarter cup of plain Open Nature Greek Yogurt. The bacon and sundried tomatoes not only add flavor but also salt so no extra seasoning is needed. Finally, I finely chop up broccoli and sprinkle that in there for a quick veggie hit but you could also add (or replace it) with some chives for more flavor. Once I had all my ingredients mixed up, I transferred the mixture from the bowl I was using into a Pyrex jug to make pouring it into the cupcake tray easier. I still spilled a bit (I’m messy by nature) but a quick wipe with the Open Nature paper towels quickly cleaned it up. Pop them in the oven for 15 minutes until the egg firms up and that’s ready! I like to make a batch of these on a Sunday night and just quickly zap them in the microwave the next morning to reheat. You don’t want them to cook any more though, so just for a quick 15 seconds or so. Visit Shaws.com to find a store near you and discover more about Open Nature and recipe ideas. Preheat a skillet on medium to high heat. Chop the bacon into small pieces and add to the hot pan. When the bacon is about 3/4 of the way cooked, remove from the heat. Place paper towel on a place and spoon cooked bacon onto it. Drain excess fat from the pan. Put bacon back in and add the sun dried tomato and return to the heat until bacon is crispy. Meanwhile, crack 8 eggs into a bowl. Add the greek yogurt and whisk together. Add the bacon, sun dried tomatoes and the broccoli. Mix to combine. Grease a cupcake or muffin tin. Pour the mixture into the tray until filled 2/3 of the way, until you have 10-12 filled. Bake for 15 minutes or until the egg has just set. Remove and allow to cool. Serve warm or store in the fridge, in a sealed container, for up to 4 days.